I’ve been doing yoga a lot lately, and one of the facts of yoga life is that the mat starts to smell funky. Research on the interwebs reveals that people spray with Febreze, or with store-bought yoga mat spray. Further research tells me that these sprays are pretty much alcohol, which kills most of the bacteria,and fragrance, which covers up the smell of the alcohol. This is another of those non-recipe recipes. I hate to say this even is a recipe, or a project, because it’s so simple. Step 1: Buy cheap vodka. You might already have some, I don’t know. 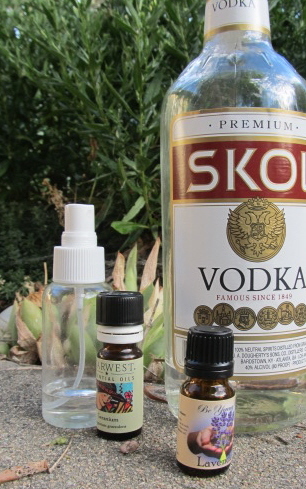 Step 3: Half fill spray bottle with cheap vodka, add tap water, add “some” drops of essential oil. How many drops will depend on how strong you want it. Step 4: spray onto stuff that’s stinky. I have a bunch of different varieties of essential oil; the last batch I made I used geranium and lavender- refreshing and “green”. Tea tree oil is also supposed to be anti-bacterial, but I’m not in love with the smell. I guess I’m picky. Peppermint would be refreshing, rosemary smells kind of like cheap men’s cologne. Here’s the thing- if you don’t already have cheap vodka and some essential oils, you might be better off just buying some official yoga mat spray and just be done with it. Amazon has different varieties for around 10 bucks, but it strikes me that you can buy a lot of cheap vodka for that, and some essential oils, which you can use for other things. For example, I use the oil for homemade handcream, and just adding drops to my bathwater. I use the cheap vodka for…cheap vodka. Nah, I’ve made homemade cherry liqueur, and limoncello. You know, not just screwdrivers and jello shots. lol- you should- I’ve been recommending it to everyone, and most people just roll their eyes at me, but it feels soooo good.